For	The Zambian Peoples PACT. Lets come together and Honour the great man of Africa. In April 1949 Kaunda returned to Lubwa to become a part-time teacher, but resigned in 1951. In that year he became Organising Secretary of the Northern Rhodesian African National Congress for Northern Province, which included at that time Luapula Province. On 11 November 1953 he moved to Lusaka to take up the post of Secretary General of the ANC, under the presidency of Harry Nkumbula. The combined efforts of Kaunda and Nkumbula failed to mobilize the indigenous African people against the White-dominated Federation of Rhodesia and Nyasaland. In 1955 Kaunda and Nkumbula were imprisoned for two months with hard labour for distributing "subversive" literature. Such imprisonment and other forms of harassment were normal rites of passage for African nationalist leaders. The experience of imprisonment had a radicalizing impact on Kaunda. The two leaders drifted apart as Nkumbula became increasingly influenced by white liberals and was seen as being willing to compromise on the issue of Black majority rule, waiting till the majority was 'ready' before extending the franchise. This was, however, to be determined by existing property and literacy qualifications, dropping race altogether. Nkumbula's allegedly autocratic leadership of the ANC eventually resulted in a split. Kaunda broke from the ANC and formed the Zambian African National Congress (ZANC) in October 1958. ZANC was banned in March 1959. In June Kaunda was sentenced to nine months' imprisonment, which he spent first in Lusaka, then in Salisbury (now called Harare). While Kaunda was in prison, Mainza Chona and other nationalists broke away from the ANC and, in October 1959, Chona became the first president of the United National Independence Party (UNIP), the successor to ZANC. However, Chona did not see himself as the party's main founder. When Kaunda was released from prison in January 1960 he was elected President of UNIP. In July 1961 Kaunda organized a civil disobedience campaign in Northern Province, the so called Cha-cha-cha campaign, which consisted of burning schools and blocking roads. Kaunda ran as a UNIP candidate during the 1962 elections. This resulted in a UNIP–ANC Coalition Government, with Kaunda as Minister of Local Government and Social Welfare. In January 1964 UNIP won the General Election under the new Constitution beating the ANC under Nkumbula. 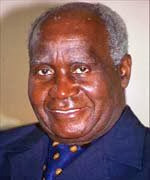 Kaunda was appointed Prime Minister. On 24 October 1964 he became the first President of independent Zambia. Reuben Kamanga was appointed as the first Vice President.